A scenic, nature-inspired journey delivering the best of the Arctic's unique Sami culture, amazing scenery and exhilarating winter activities. This is a great pre or post option for our Cortina conference. Visit one of the northernmost inhabited areas in the world and experience a unique Sami culture, amazing scenery and exhilarating winter activities with this short highlights tour. 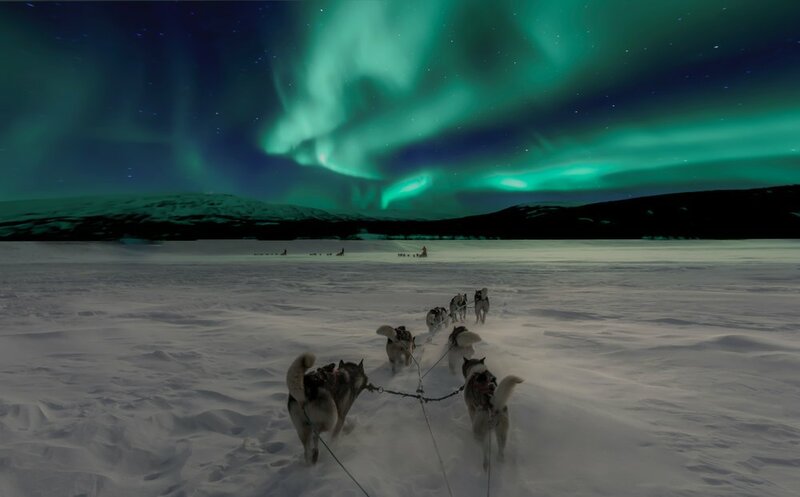 Spend a night in the magical Kirkenes Snow Hotel, Hurtigruten cruise along the famous fjords around the North Cape and try your hand at dog-sledding, arctic king crab fishing and reindeer sledding. If conditions are right —be dazzled by the northern lights, preferably on the night you are sleeping in the glass igloo at Kakslauttanen, Finland. Please have comprehensive travel insurance to cover your travel arrangements, including cancellation. Please contact CPE Travel for your requirements. Details of our private escorted journey through The Northern Cape to Finland. This morning, enjoy a guided city walk of Tromsø and then you are free to either try many of the winter activities available in its vicinity or head to the lovely cafes & pubs by the water. 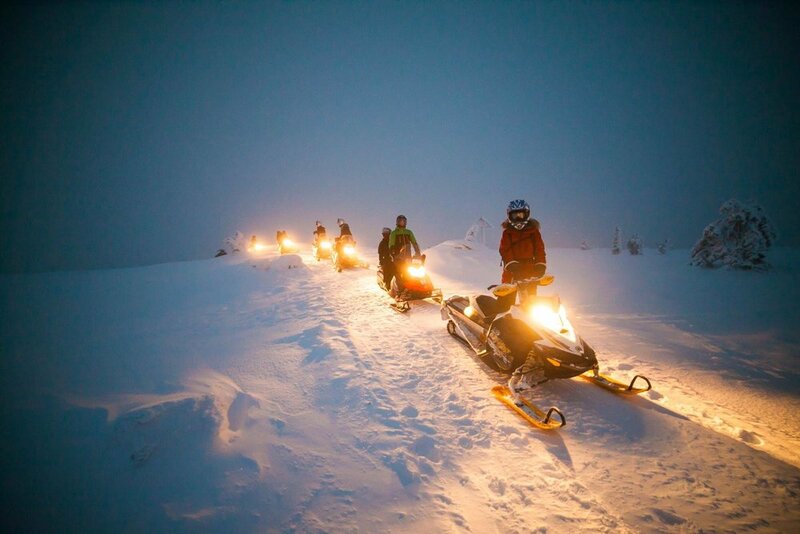 Options for additional dog sledding through the beautiful winter landscape, guided northern light tours and other possible activities. Or if it is a clear day, experience Tromsø’s best view! On the outskirts of Tromsø (it is a very small town) a cable car runs from Solliveien in Tromsdalen up to the mountain ledge Storsteinen (421 m above sea level) in just four minutes. From the viewing platform at the upper station, you can enjoy spectacular panoramic views of Tromsø and the surrounding islands, mountains and fjords. At the fully licensed Fjellstua restaurant, you can enjoy a delicious dinner based on local produce or select light meals from the café menu, while you take pleasure in the view. In winter, it's an ideal place for hunting the magical Northern Lights. At 16.30, embark your coastal ferry for a short northbound Hurtigruten journey. In winter the Captain invites guests to taste stockfish on deck. The ship now sails into the area along the coast where you have the best chance of seeing the Northern Lights between September and March, and we gather on deck to search for this breathtaking phenomenon. Included in this holiday is the chance to stand atop the North Cape Plateau where you’ll get the eerie feeling of being at the end of the world. 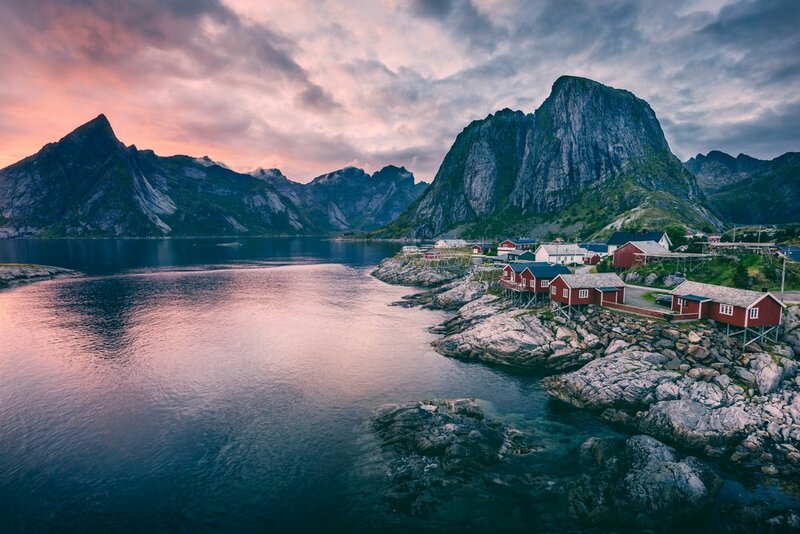 The area is also known for its birdlife, and Gjesværstappan, a bird sanctuary with up to 250,000 seabirds, is home to some High Arctic species that can only be observed here on the Norwegian mainland, including the ever cute puffins. You might see herds of reindeer and campsites belonging to the indigenous Sami people. In winter, experience the snow-clad valleys, the fresh winter air and your best chances to see the mesmerizing Northern Lights. 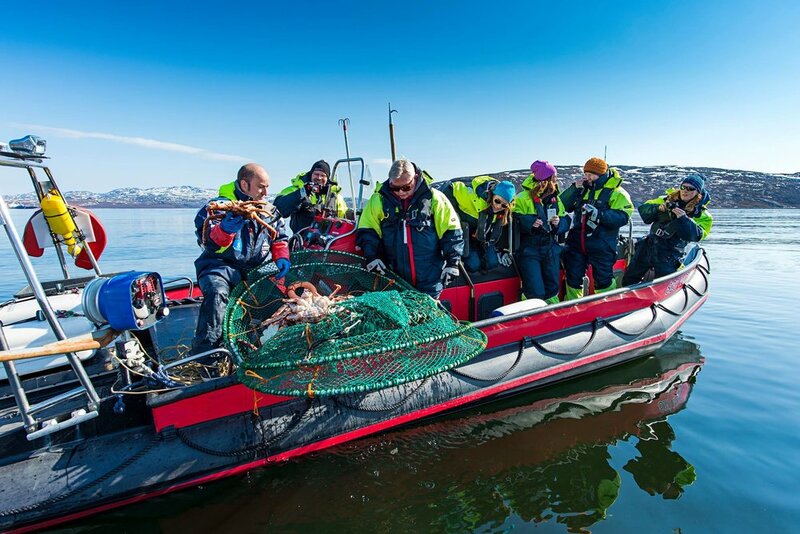 During winter and spring, if you are lucky, local fishermen from the village of Kjøllefjord visit us to share their catch of the day (King Crab & cod). This evening, as you approach Kjøllefjord, you pass a rock formation that is sacred to the indigenous Sámi people, Finnkjerka. Optional Excursions depend on the season: Birdwatching Safari, A Taste of Lapland, Sami Autumn and Snowmobile trip in Lapland. Disembark in Kirkenes and transfer to the snow hotel. Today you will join an Arctic King Crab Safari - a very popular highlight for our travellers north. The Arctic King Crab is a sought after delicacy and you will learn how to catch, prepare and eat them. Your guide takes you out and you can lend a hand in sawing through the ice before your guide attempts to land you a few of these massive crustaceans. Enjoy the day's catch for lunch seated by a cosy fire in a small local farmhouse by the lake. You will travel to the lake by snowmobile sleigh. This evening, you can either stay in one of the warm Gamme cabins or sleep in one of the cold snow rooms at the Snowhotel. Every room in Kirkenes Snowhotel is like a small treasure. The rooms are equipped with everything needed for a comfortable night in the somewhat extreme conditions. The pictures look like you are sleeping on ice, but that would be too cold and too hard for your back. The beds are framed with ice blocks and the beds have comfortable mattresses with thermal insulation on top. You sleep inside a sleeping bag graded for -35 degrees celcius. However, snow is a very good insulator, so even when it's -35 degrees outside, the Snowhotel remains a stable -4 degrees. Upon entering the gates of the Snowhotel, you will receive a welcome drink at the snowbar, made from berries collected from surrounding hills. It will then be time to make the ‘coolest’ hotel check-in around! Private transfer from Kirkenes to Kakslauttanen (3.4 - 4 hrs). Check in to your Glass Igloo where you will be spending the first night of the tour. Dinner at hotel then get ready for your night in under the stars - and hopefully the Northern Lights. Finnish Glass Igloos provides 'one-of-a kind' opportunities to admire the Northern Lights and millions of stars in the crystal clear sky while enjoying a comfortable room temperature. Built from a special thermal glass the temperature inside the Igloo always stays at a normal level. It also prevents the glass from not getting white frosted, hence keeping the view clear even when the temperature outside drops to under -30°C. Standard igloos are equipped with a toilet, but no shower. There is an upgrade option to a large igloo (KELO). After breakfast, move to your log cabin and then get ready for today's husky safari - an unforgettable journey through breathtaking winter scenery. On arrival to the husky farm we will provide you with a warm outer thermal suit, gloves and hat and then we will present your very own husky team. You will be given a lesson on how to drive the sledge and how to observe important hand signals given by your leader. This afternoon is free to relax before your evening aurora hunting by reindeer. Want to attend the London or Cortina Conference?